Once upon a time, a beautiful Malay princess fell in love with a mighty Malay warrior. One day, the warrior was summoned into battle, leaving his beloved princess behind. As years passed, there was still no sign of the warrior's return. Pining for her love and facing pressure from her father King to marry another, the lovelorn princess climbed a hill and overlooking a beautiful valley facing the direction where her love had gone, and after declaring aloud her undying devotion to her beloved, plunged a dagger into her heart and died. Her blood seeped into the ground and as eons passed, the stones dyed red with her blood, were perpetually marked with the reddish hues amidst the natural green of their colour, and thus was formed the stones of rich reddish green we now call DARA JADE. 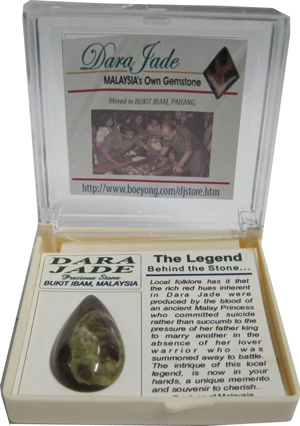 Thus begins the many romantic legends surrounding DARA JADE, a semi-precious stone of the surpentine class that was found and mined only in what was once an open valley, the remnant of an old open cast iron mine in Bukit Ibam, Malaysia. Incidentally, "DARA" means "maiden" or "Virgin" in the Malay Language, as was thus christened by our late 2nd Prime Minister of Malaysia, YAB Tun Abdul Razak in 1976. 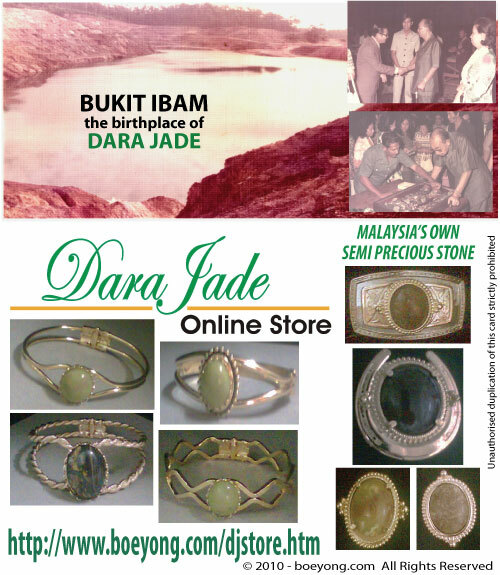 DARA JADE flourished under the patronage of the late 2nd Prime Minister, and was used for jewelry, trinket boxes, cigarette lighters, and decoration pieces, all beautiful and elegant, in its many hues of reddish brown and green. No 2 stones alike. We however, have specially themed sets in the same colour for setting into jewelry at your own jewellers. Change your banners anytime you want for just US$2. per banner. Only two positions per page. Top and bottom. Top - US$20. Bottom - US$10. Only two banners in the same position. Pay using PayPal (boeyong@yahoo.com),and NETELLER.